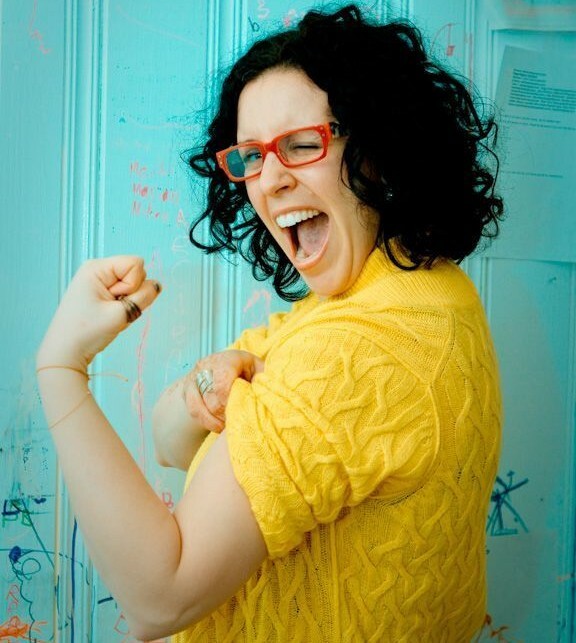 The Mother of all Founding Moms, Jill Salzman, talks about the folly of underestimating working moms, the importance of “doing” rather than “mulling,” and how she can’t resist the sweet crooning of Chaka Khan. With The Founding Moms, you’ve focused your business on women who are both moms and entrepreneurs. What were the work and family roles in your household growing up? And why do you think it’s important for your kids to have a working mother? My mom went back to school when all 4 of us were school aged. My dad worked, too. What I loved watching and I try to emulate is how having two working parents made them feel better about themselves, and in turn they became better parents. I want my girls to see a strong mama who is very happy with what she is doing and has a strong sense of self so that they will repeat what they see. You started your first business after law school. What was the impetus for entering the world of entrepreneurship rather than the corporate world? I knew I wanted to have a baby at some point. And I knew that my temperament was not built for a corporate office setting. So I launched my business out of a home office, intending to start a family one day. So, there is this perception in some corners of the corporate world that women are somehow less committed to their jobs once they become mothers. What are your thoughts on this? It’s true that many companies have concerns about hiring a working mother. Why choose a woman with familial commitments? What if she’s distracted and doesn’t give you her all? Doesn’t her memory leave her body along with the baby? Spoiler alert: She’s likely a better candidate than the rest of your options. Hiring a working mother allows companies to flourish. After all, employers need to work with employees who are smart, nimble, work well with others and can devote a lot of time to helping you build your business. And when a company hires a working mother, it allows her and her whole family to profit from the opportunity. You launched The Founding Moms through your efforts to connect with other mom entrepreneurs. Why was it so important for you to connect with mom entrepreneurs specifically? And why do you think that’s true for your Founding Moms? I knew that, at least for me, I was yearning to find out how other women were doing it. How were they raising a baby and building a business and having that business succeed without it being to the detriment of their children. I had a billion questions. In retrospect, I realize that I had questions of any business person with or without kids. I wanted my business to grow. I wanted to get more sales, to get more marketing going, to learn more about legal and accounting practices. But the extra guilt or concern that I thought was something to worry about made me realize I wanted to reach out to women in my exact same boat. So I did. Turns out a lot of women have the same desire and I had no idea at the time! You mentioned that you launched a business with starting a family in mind. Do you find many Founding Moms have left (or avoided) traditional jobs because of work/life balance concerns? Tons of them! And the more they see others doing it, the more they realize that they can make something for themselves. It’s not yet a tidal wave but it’s more and more folks who show up to our Founding Moms’ Exchanges terrified to have gone out on their own and relieved to find a group of like-minded women who’ve just done it, too. What is one piece of advice you wish you could offer your pre-children self? I’d want to tell myself at least 3 times a day: IT TAKES TIME. I’m a true entrepreneur in the sense that I always want things to happen yesterday, and I want it all to go faster, all the time. But building a business is much like raising a child — they don’t become adults in 2 weeks no matter what you teach them. Don’t we all! But yes, patience is a virtue. So, how did you share the news of your pregnancies with your clients? I spent many weeks in fear, trying to avoid telling my clients because they would a) leave, b) judge, c) become angry at me. It all sounds so ridiculous now! I ended up biting the bullet about 4 months in and every single client was thrilled for me. This was almost a decade ago, and doing what I do for a living — I’d be shouting it from the rooftops now! The pregnant-working-mom landscape is likely a bit different than it once was. That it is! What was your maternity leave like? My leave is not for everyone. I only took 2 weeks with each child. Since I worked in a home office, I was able to work and take care of my babies pretty early on. I nursed while I typed. I changed diapers between calls. That whole babies-sleep-for-18-hours-a-day thing really helped. Yes, so many people underestimate the super productive powers granted by narcoleptic infants! Advice for moms looking to make the leap? JUST DO IT! I can’t say that loudly enough. Stop thinking about it. Don’t waste time planning. Just do it and you’ll figure out if it’s right for you. There’s no better way. Chocolate milkshakes. Every day. Because you can convince yourself under the delusion of pregnancy hormones that chocolate and milk both have a lot of protein in them. As a working parent, I never expected WORKING MOM GUILT would be so hard and GETTING WORK DONE would be so much easier! We’ve heard that you’re a wedding singer. We’ve got to ask, what’s your favorite song to sing? Ha! “Ain’t Nobody” by Chaka Khan, for sure.